Combine first 10 ingredients in a shallow dish or large zip-top plastic freezer bag. Cut pork diagonally into 1-inch-thick slices, and add to tequila mixture. Cover or seal, and chill 1 hour, turning occasionally. 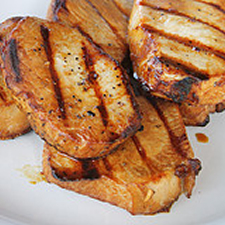 Remove pork from marinade, discarding marinade. Grill, covered with grill lid, over high heat (400° to 500°) 3 to 4 minutes on each side or until done. Per Serving: 198 Calories; 5g Fat (26.0% calories from fat); 2g Saturated Fat; 32g Protein; 2g Carbohydrate; trace Dietary Fiber; 98mg Cholesterol; 435mg Sodium. Exchanges: 0 Grain(Starch); 4 1/2 Lean Meat; 0 Vegetable; 0 Fruit; 0 Fat.